Today brings some significant news regarding our merchandise! We are teaming up with the burgeoning imperium known as Trust No One Merchandise to sell all our merch online in the EU region. As of today’s launch, there will be some older designs in the shop which we have sold at our gigs up until now. But fear not, in a short while we’ll have a couple of new designs up as well – one of those will be a TNO only design and not sold at any shows. 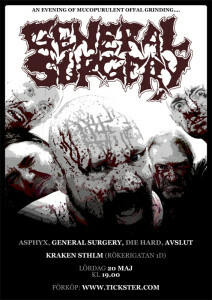 All orders will come with a free General Surgery/Butcher ABC split CD, plus some other assorted goodies. 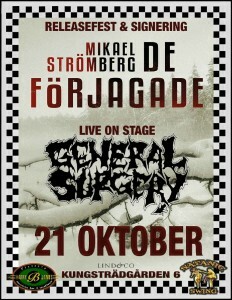 We’ll be the evening’s entertainment at the release party for Mikael Strömbergs new book ”De Förjagade”. This shindig will happen on Saturday 21st of October at Harry B James in Stockholm. Don’t miss out and we’ll see you in the bar! 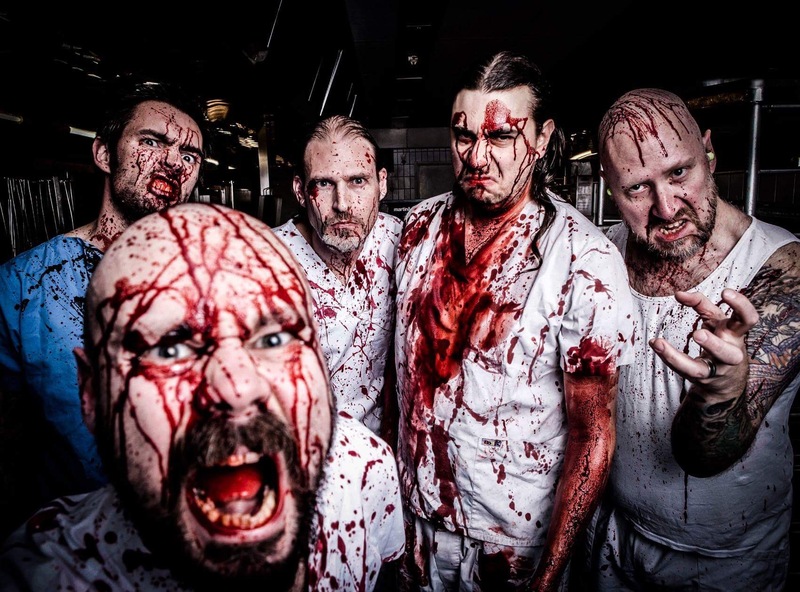 ”30 years of gore-soaked insanity in the GENERAL SURGERY operating room have passed, and what better way to celebrate than to perform at one of the prime festivals for such noise, OEF. 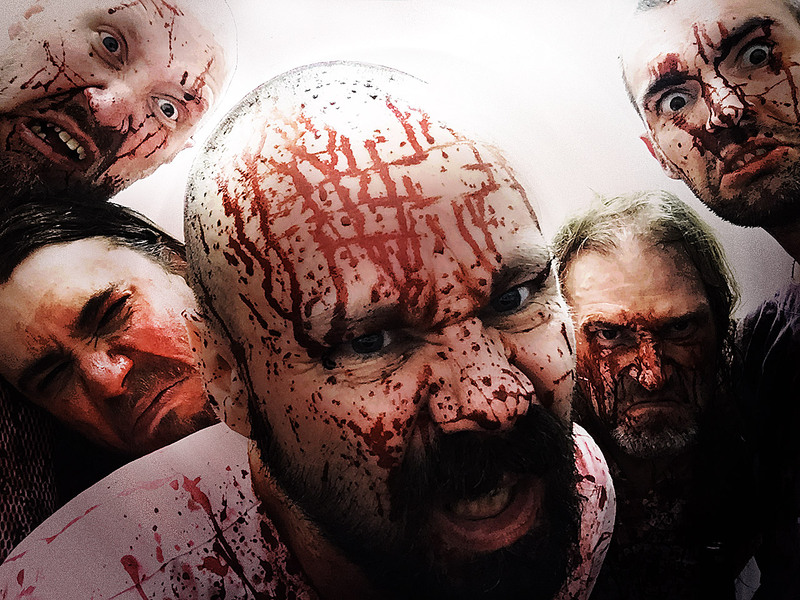 For this anniversary they’ve somehow managed to dust off their old vocalist to once again temporarily join their ranks in order to achieve the proper chaos of the songs that started it all. Prepare yourself orderly and don your protective clothing – get ready for a full performance of the Necrology EP along with choice cuts from the surgery team’s entire putrid discography. If that’s not something to look forward to, we don’t know what is. 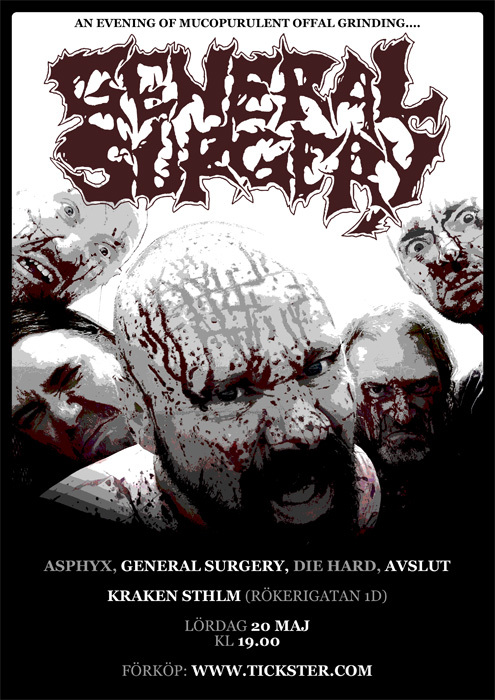 The time is drawing near for our first show in Stockholm in about 4 years… Saturday May 20th, this time as direct support for Asphyx on their first gig in Stockholm. We’re surely looking forward to that! Tickets available at Tickster for only 220 SEK. Show starts at 19:00. There will be a limited amount of the split LP with Bodybag for sale at the show, 150 SEK – cash only.